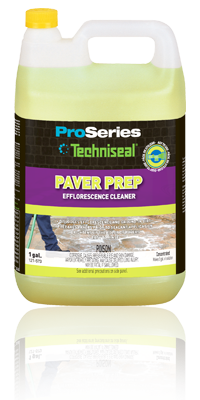 Techniseal® paver prep is specially formulated to dissolve efflorescence (whitish salt) and remove ground-in dirt (traffic marks, etc.) on pavers, slabs and retaining walls made of concrete. Containing no hydrochloric (muriatic) acid, it works deep without discoloring or damaging the surface. It brightens up colors, cleans evenly and enables protectors to better penetrate the material. Techniseal® adaptable sprayer (sold separately) makes application easier and quicker. Approximate Coverage: 200 sq. ft.